Editors' Note: There is a graphic associated with this press release. 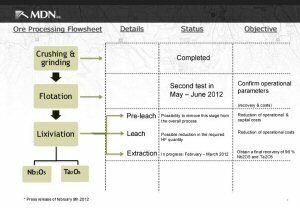 MDN Inc. ("MDN") (TSX:MDN) is pleased to provide an update on the progress of metallurgical testing for its Crevier niobium-tantalum property. The Crevier property is located north of Girardville in the Quebec's Saguenay-Lac-Saint-Jean region, and is 72.5% owned by MDN Inc. and 27.5% by IAMGOLD. 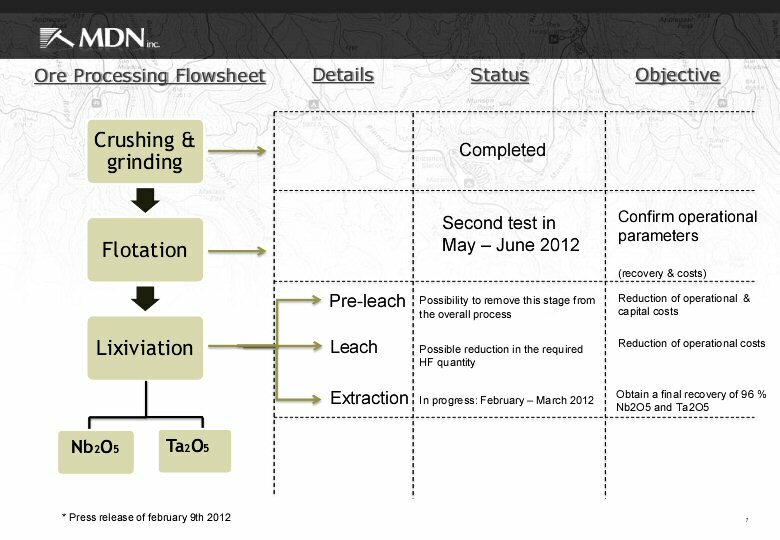 The metallurgy work is being done as part of a feasibility study now underway. "Despite this delay in the preparation of the feasibility study, we reiterate our confidence in the potential of the Crevier project and our interest in its development. This optimization of the ore treatment process will give us the confidence we need to make a construction decision for this new mining project," said Serge Bureau, President and Chief Executive Officer of MDN. MDN Inc. (TSX:MDN) is a mining exploration and development company exploring and developing projects in Quebec and Tanzania. The company is also active in the search for new business opportunities that can increase shareholder value. As well as holding a 30% participating interest in the Tulawaka gold mine, MDN has also discovered gold in Tanzania at the Ikungu property, where four high-grade gold zones have been identified. MDN Inc. also owns a 72.5% interest in Crevier Minerals Inc., which owns an NI 43-101 niobium-tantalum resource in the Lac-Saint-Jean area of Quebec. MDN has an option to increase its interest in Crevier Minerals Inc. to 87.5%. Additional information is available on MDN's website at www.mdn-mines.com. Forward-Looking Statements Other than statements of historical fact, all statements in this release that address events or developments that the Company expects to occur are forward-looking statements. Although the Company believes that the expectations expressed in such forward-looking statements are based on reasonable assumptions, such statements are not guarantees of future performance, and actual results may differ materially from those in the forward-looking statements. Factors that could cause the actual results to differ materially from those in forward-looking statements are discussed in greater detail in the Company's most recent Annual Information Form filed on SEDAR, which also provides additional general assumptions in connection with these statements. Investors and others who base themselves on the Company's forward-looking statements should carefully consider the factors mentioned in the Annual Information Form as well as the uncertainties they represent and the risk they entail. The Company believes that the expectations reflected in those forward-looking statements are reasonable, but no assurance can be given that these expectations will prove to be correct, and as such, the forward-looking statements in this press release should not be unduly relied upon. These statements speak only as of the date of this press release.